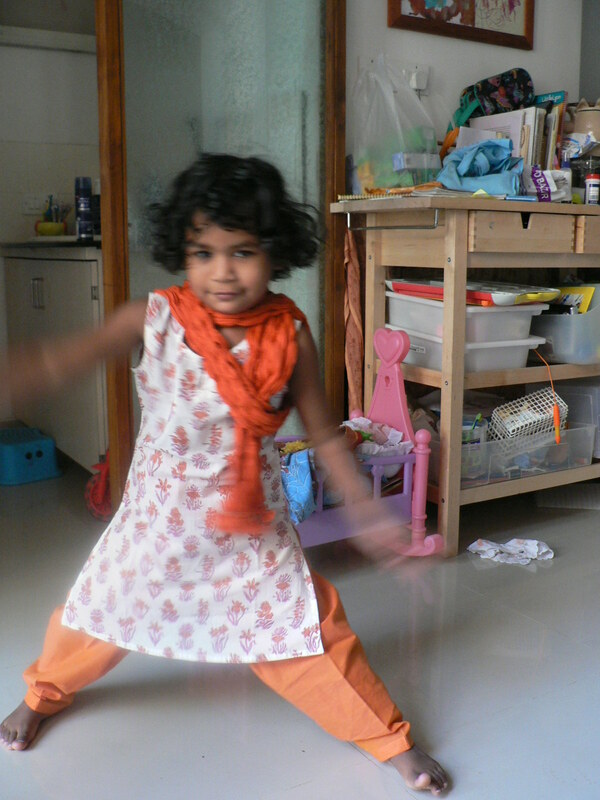 And she poses in her ‘first ever’ salwar kameez…. dupatta and all. 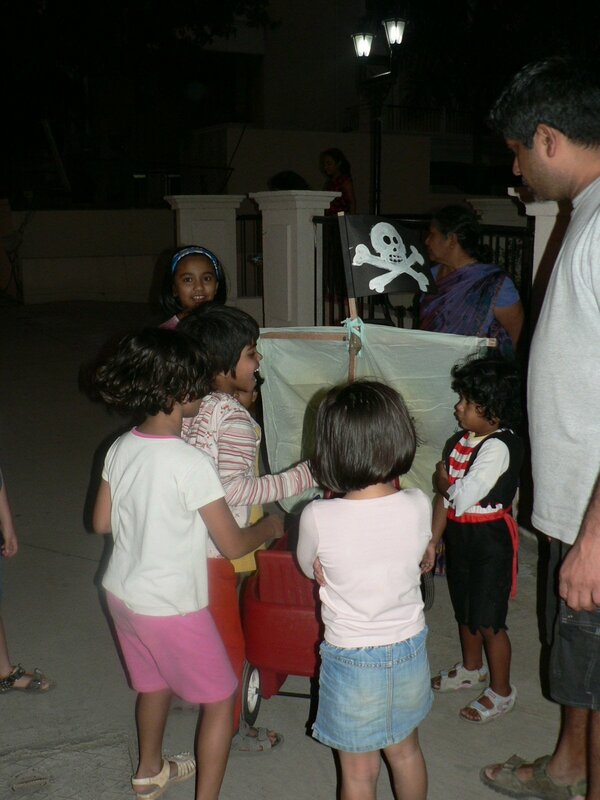 We, Ravi’s mom, Ravi, kids and I worked over the w’end on a watery space (large blue sheets) in our balcony and a conversion of the wagon into a pirate ship…. thanks to Abucha and Nikhil Kaka for the wagon!! Shall post more pics of this pirate ship as we work on it. Here you see the kids from our building clambering for rides on the wagon…. 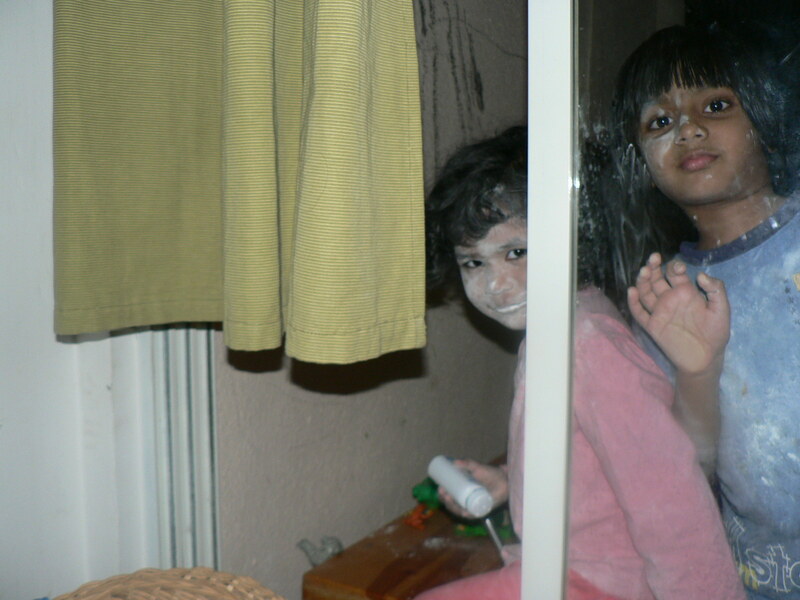 when we took it downstairs for some wind in the sail. 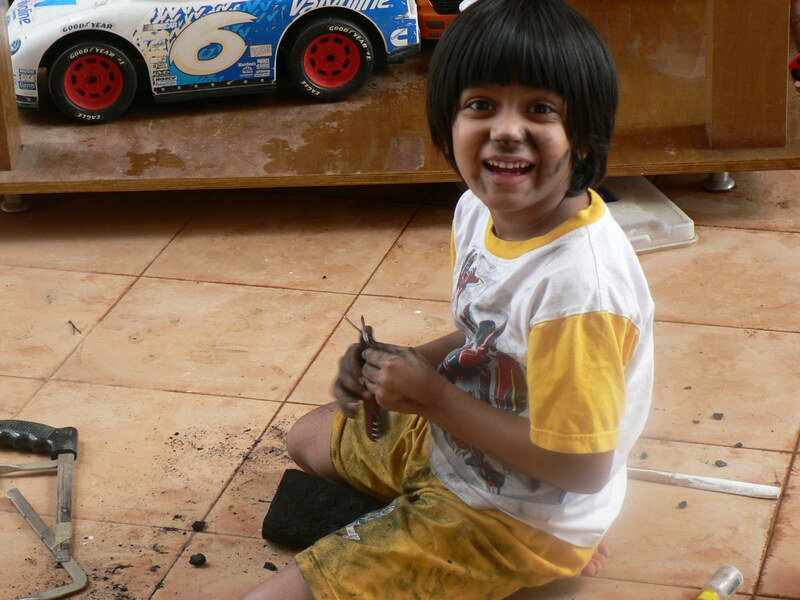 Raghu used burnt wood from our bonfire to make powdery charcoal powder. Ravi is often in the mood to force laughter… Gabbar takes over and the kids go wild. With these meditative techniques, raising children can be a spiritual practice. 1. Try to imagine the world from your child’s point of view, purposefully letting go of your own. Do this every day for at least a few moments to remind you of who this child is and what he or she faces in the world. 2. Imagine how you appear and sound from your child’s point of view, i.e., having you as a parent today, in this moment. How might this modify how you carry yourself in your body and in space, how you speak, and what you say? How do you want to relate to your child in this moment? 3. Practice seeing your children as perfect just the way they are. See if you can stay mindful of their sovereignty from moment to moment, and work at accepting them as they are when it is hardest for you to do so. 4. Be mindful of your expectations of your children and consider whether they are truly in your child’s best interest. Also, be aware of how you communicate those expectations and how they affect your children. 5. Practice altruism, putting the needs of your children above your own whenever possible. Then see if there isn’t some common ground, where your true needs can also be met. You may be surprised at how much overlap is possible, especially if you are patient and strive for balance. 6. When you feel lost, or at a loss, remember to stand still and meditate on the whole by bringing your full attention to the situation, to your child, to yourself, to the family. In doing so, you may go beyond thinking, even good thinking, and perceive intuitively, with the whole of your being, what needs to be done. If that is not clear in any moment, maybe the best thing is to not do anything until it becomes clearer. Sometimes it is good to remain silent. 7. Try embodying silent presence. This will grow out of both formal and informal mindfulness practice over time if you attend to how you carry yourself and what you project in body, mind, and speech. Listen carefully. 8. Learn to live with tension without losing your own balance. In Zen and the Art of Archery, Herrigel describes how he was taught to stand at the point of highest tension effortlessly without shooting the arrow. At the right moment, the arrow mysteriously shoots itself. Practice moving into any moment, however difficult, without trying to change anything and without having to have a particular outcome occur. Simply bring your full awareness and presence to this moment. Practice seeing that whatever comes up is “workable” if you are willing to trust your intuition. Your child needs you to be a center of balance and trustworthiness, a reliable landmark by which he or she can take a bearing within his or her own landscape. Arrow and target need each other. They will find each other best through wise attention and patience. 9. Apologize to your child when you have betrayed a trust in even a little way. Apologies are healing. An apology demonstrates that you have thought about a situation and have come to see it more clearly, or perhaps more from your child’s point of view. But be mindful of being “sorry” too often. It loses its meaning if you are always saying it, making regret into a habit. Then it can become a way not to take responsibility for your actions. Cooking in remorse on occasion is a good meditation. Don’t shut off the stove until the meal is ready. 11. There are important times when we need to be clear and strong and unequivocal with children. Let this come as much as possible out of awareness, generosity, and discernment, rather than out of fear, self-righteousness, or the desire to control. Mindful parenting does not mean being overindulgent, neglectful, or weak; nor does it mean being rigid, domineering, and controlling. 12. The greatest gift you can give your child is your self. This means that part of your work as a parent is to keep growing in self-knowledge and awareness. This ongoing work can be furthered by making a time for quiet contemplation in whatever ways feel comfortable to us. We only have right now. Let us use it to its best advantage, for our children’s sake, and for our own. Mindfulness expert Jon Kabat-Zinn is the author of Wherever You Go, There You Are. Myla Kabat-Zinn has worked as a childbirth educator, birthing assistant, and environmental activist. Excerpted from Everyday Blessings: The Inner Work of Mindful Parenting. Copyright 1997 by Myla Kabat-Zinn and Jon Kabat-Zinn. Today is a day i would add to the Bharadwaj annals as a SHINY day. I’ve been a part of the Shine with unschooling Yahoo group for a few weeks and have begun to love Anne O (the list owner). There is something powerful present in her words. When one works on themselves it comes thru to everything else. I never understood the importance of true inner work until recently…. and its impact on our children and their true selves. This morning Raghu poured the pancake batter onto the hot pan by himself. He then proceeded to flip the pancakes all by himself. I TRUST him now…. I never fully did before. Even now… the need to say “be careful” or some such is still present in me. Being able to stop those words from coming out and perhaps adding a safety net without compromising the child’s need for independence is the way to go… as many times as is possible. We had a great time and enjoyed the pancakes. Z enjoyed watching us flip. Raghu singed his knuckles a bit during one flip. He cried and then allowed me to wash his hands with cold water and apply a burn cream. The he went on to make another pancake for me… smiles and all. 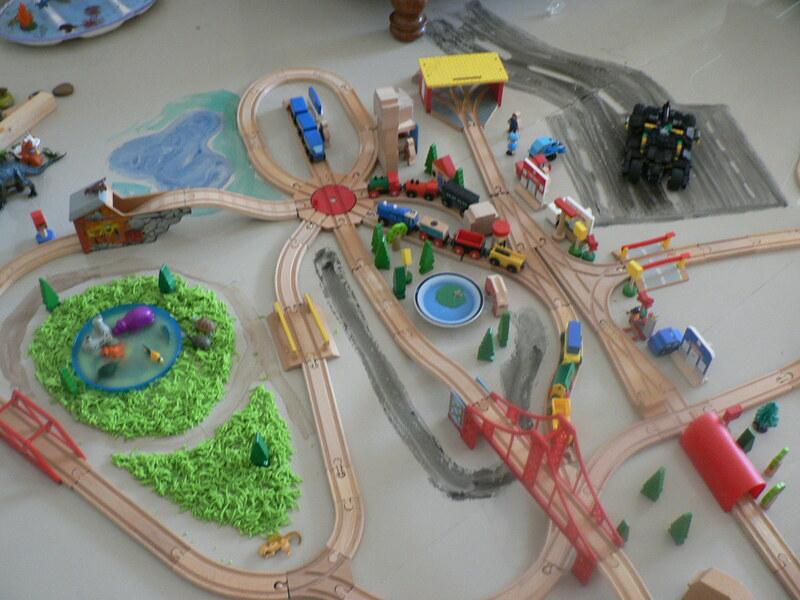 Raghu had been building a train station in the front room. Its been an ongoing project for about 2 days. He decided it was actually a part of Gotham City. He then placed the Batman Lego Car he had built at one side and declared Batman the protector of the city. 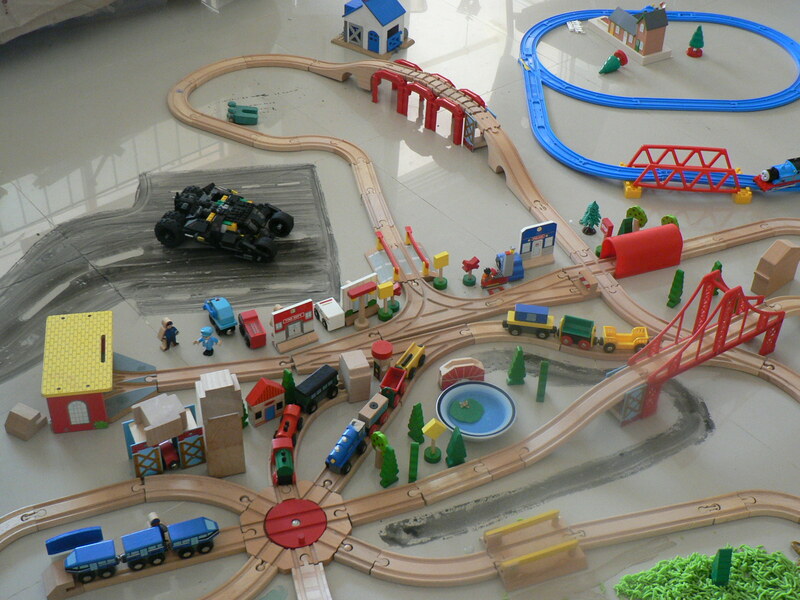 He took out all his old wooden buildings, blocks, etc. He created a complicated city with lots of city services like hospitals, garages, homes, high-rises, police station, express train stops, etc. 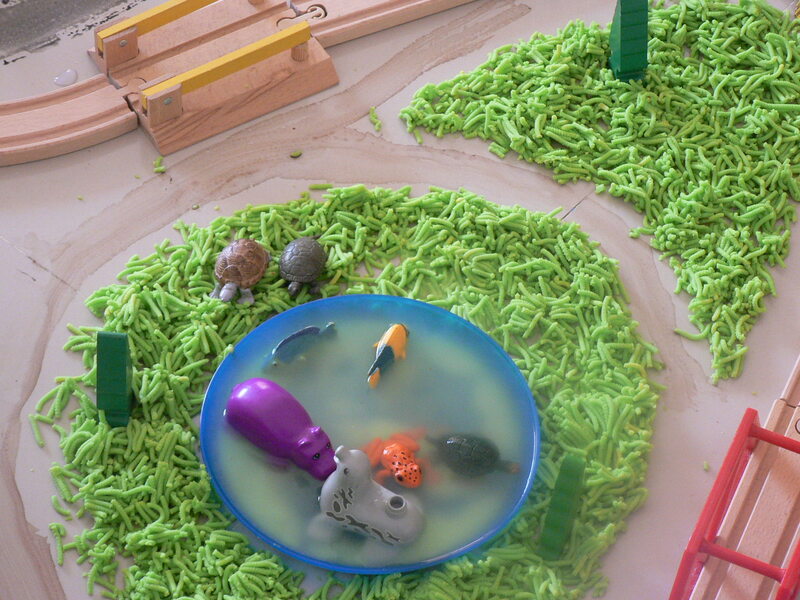 Then he took a round shallow bowl and added water and voila a lake in the middle of a park was created. he created a park with wooden trees all around. Now i could not help myself… i had to ask if i could help and play with him. he said yes. So then we added blue watercolor to the lake. 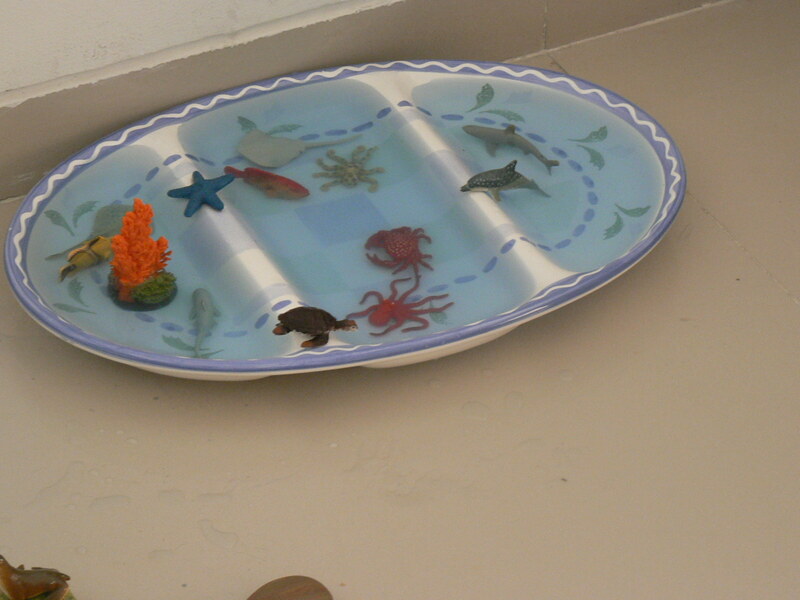 We created an aquarium in a large tray filled with water. We got out all the fish, crabs, octopuses, turtles etc and placed them. Then some potato press green playdough and our park was really rocking. By then i had to watch Raghu and see if he still wanted me to be a part of it or not. I told him i would be his helper/fetch-person… and he loved it. He told me to paint roads and also asked me to do things in a particular way. When i noticed that there had been enough discussion, fun for both of us etc… i retreated. But he asked me to build the zoo with Z. So on we went. We never did finish the zoo as Z was not in the mood. But it was a gorgeous experience for me…. and i think a very shiny time for R. I am also amazed at how precision oriented his building, arranging and organization of the city was. Also thru the morning I was playing The Chieftains… lovely fast paced, Irish, Celtic type music. Ravi’s rocking BH (before Hema) collection always surprises me. 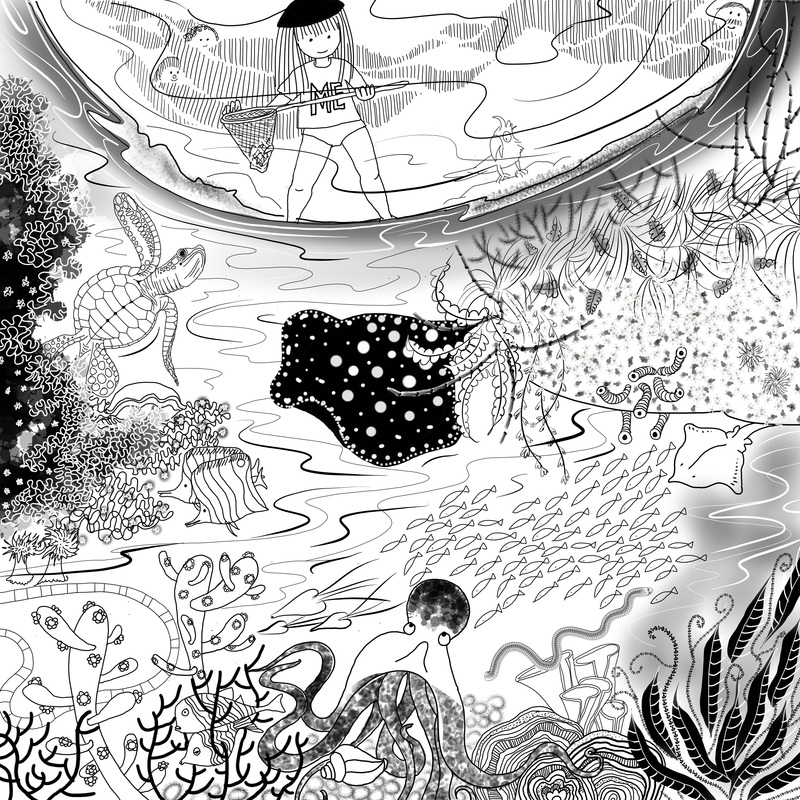 Z kept nodding her head and kept beat with her curls swaying and head bobbing. Amazing time really for her and my camera. Late in the evening when dinner turned into pizza and wine night… Raghu suggested a small bonfire. When i put up blocks… he simply said… candles, some wood and a clear space around it is all he wanted. Geesh… i went ahead and found an old tin box, some lovely wood chunks, candles and start-up paper. And it turned into a shiny, bright tin box, bonfire. We danced, ate pizza and laughed for a while on the balcony. Our 8 feet square balcony was enough for this little boy’s fire wish to come true. We switched off all the lights in the house and enjoyed the bright flames. We were consciously silent as the kids ripped up the empty pizza boxes and lit them with the candles and then threw them quickly into the tin box. Z too!! 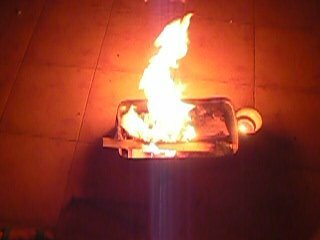 We did not have the energy or ability to fulfill Raghu’s next wish… which came about after the bonfire was almost done…. a camp-out in the balcony. He wanted us to set up the new tent we bought in Sg., challenging enough even when we aren’t tired. We were already pretty woozy. It was not just the wine 🙂 I’d had a long day with Z pooping in new places and peeing enormous quantities into the portable potty, besides all the other fun I’ve described above. And a playdate in the evening…. and some bicycling downstairs. And Ravi’s day and week even had been rough. So sadly just could not do more. But we’ve promised him a camp out on Saturday night. Hopefully his wish will still be flaming till then. Zoya managed to pick up the land-line while i was in the bathroom… and recognized Ravi’s voice on the other end, despite the crackling line. She then told him that i was in the bathroom and said bye. Amazing little girl. Don’t know when she learnt to do a complete call all by herself.